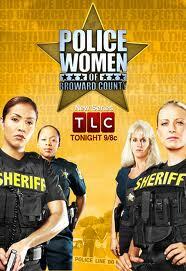 The Learning Channel series Police Women of Broward County focuses on women cops balancing intense police drama with home and family life. Reality TV producer Leslie Coffee, who works with Cheri Sundae Productions, talked to us about her role in the TLC show. “As a field producer, one of my absolute favorite jobs to do, it’s all about getting the story in the field. 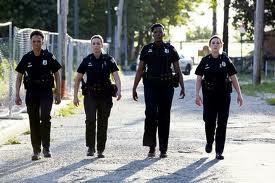 On a show like Police Women, I have no idea what each day will bring, and must be able to roll with anything that happens. 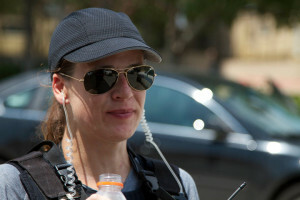 Field-producing for Police Women requires juggling the acquiring of an accurate and compelling story while avoiding interfering with police work and the legal process. Developing a sensitivity to the victims is also critical. Keeping a straight face “while asking someone what it was like to be probed by aliens is sometimes more than someone can handle,” she says. Coffee opposes manufacturing a story. “I absolutely do not believe in creating from the footage a story that never actually happened. There’s nothing that gets to me more as a TV producer… It is what gives this side of the business a bad name, and I find, as a producer, I’m often fighting the public’s perception that it’s all fake. It’s not all fake. Some of it is, and I think we can all tell which shows those are. The viewing public can easily feel jaded and cynical about reality shows. We asked Coffee how she achieves authenticity. How does she keep it real without scripting it? She continues, “To define what I think of as scripting a reality show, and to talk about what the viewing public thinks of as scripting a reality show, are often two different things. Before going out in the field, through my research and pre-interviews, I have an outline and a pretty clear idea of what the story is. Once out in the field, things can evolve or change. Once in post, they can change again. However, the basic idea of the story typically remains the same. “Two of the most important things to have,” Coffee says, “are a true passion for what you do, and a tenacity that won’t let you quit. This business is very competitive, and if you don’t love it, or you don’t keep going with everything you have, you won’t make it. There’s always someone in line ready to take your place. The responsibilities behind the title “producer” will vary in reality television. Leslie Coffee, whose experience includes Police Women of Broward County, Police Women of Dallas, and Weird Travels, talks about the roles of story producer, field producer, and supervising producer. Thinking ahead is essential. “Story producing also involves writing interview questions, and making sure the questions cover exactly the information you need to tell the story. I think information is always better coming from the person being interviewed rather than in voice over. After all, not every show uses voice over. Doing your homework ensures your show will get on the air. “Releases (location, appearance, materials) are a huge part of the job,” says Coffee, “and often overlooked by sloppy producers. As a story producer, I’ll get as many pre-signed as possible. Without the proper legal paperwork signed, you can have the best interview in the world, but nobody will see it. Lawyers don’t care about excuses, they want paperwork backing EVERYTHING up. Otherwise, you as the producer are putting the production company in a litigious position. “As a Field Producer on documentaries or magazine-style entertainment news shows, the shoot has already been set up by the story department, and it’s a matter of making sure everything they want covered actually gets covered. This includes interviews, any A-roll or main story shooting (like a celeb surprising a fan), any supporting B-roll, and if the show calls for it, recreations. “I’ve worked mostly cable TV shows, which for me, means I typically work with a smaller crew comprised of a cameraperson, audio tech, and either/or an associate or segment producer and a production assistant (PA). “The field producer is the ‘boss’ in the field, so on smaller projects like documentaries, I also put out daily call sheets (a production manager’s job on bigger shows), daily production notes (or a hotsheet), as well as any remaining coordination with locations, interviewees, etc. “Important aspects of being a successful field producer include being able to adapt quickly and easily, not getting stressed out when things don’t go as expected, problem solving in the moment, and managing people (anything from emotions to ego to nerves). As a Supervising Producer, Coffee’s responsibilities center on the “big picture”. She says, “I hire and manage any in-house producers (segment, story, associate, etc. ), hire any field producers, as well as know where each story stands at all times. I have to make sure scripts are written in time for edit, and coordinate with the post supervisor to make sure edits are done on time for show delivery, from rough cut through lock. Time and money involved are the biggest differences. “I find films work on a much larger budget with much larger staffs and for a much longer production schedule. A film may be in pre-production for months, a year, even longer, while for TV shows, it’s anywhere from a few weeks to a few months. We asked Coffee if reality shows edit to any defined format. “The easy answer is, yes, shows follow a format. Just like there are differences in each kind of producing job, the type of show determines the format. It’s what the audience looks for, even if most of them never realize it. It’s the familiarity of knowing what to expect from that ‘brand’ (or show) without knowing what’s going to happen in the individual story. Pacing is a critical element in the edit. “In addition to the individual story or segment, if the show consists of several different stories or segments, you have to work with the editors to pace the entire show. Do stories arc over commercial breaks to bring the audience back? What’s the lead story? Do you have too many of the same type of stories in a show (for example: ‘rescue, rescue, rescue’ instead of ‘rescue, impact, animal’)? “I became interested in TV & Film during my junior year of high school as a possible career track. My school actually offered a Radio, TV and Film course. Not only did I enjoy the class immensely, it opened up my eyes to the industry as an actual job. I knew TV/Film was what I wanted to do, and from that year on, looked for the avenue to get there. “I went to the University of Texas at Austin, concentrating on film production, and earning a Bachelor of Science in Radio, Television and Film. I stayed in Austin for a couple of years after graduation, working the in-studio cameras at a local news station and working on any film set I could. A couple years later, wanting more out of the business, I moved to LA. I began sending out resumes, cold, to companies ‘currently in production’ listed in The Hollywood Reporter and Variety. “My first job in LA was logging tapes for Wild Things, a show Bertram van Munster did before The Amazing Race. Every job I’ve had since then has been from word of mouth and networking. I always say it’s who you know that gets you in the door, and what you know that keeps you there.